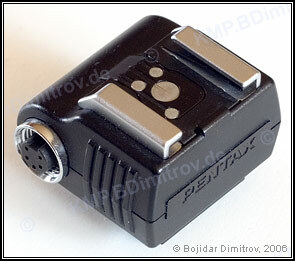 Description of the evolution, features and operation of the Pentax flash system. Discussion of the possible off-camera flash setups. Explanation of the letters and numbers making up the flash names. Auto focus — flashes with digital command interface, suitable for use only with the AF bodies. 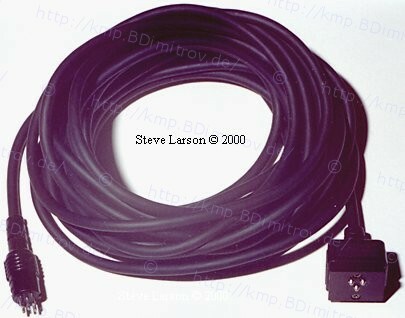 TTL — flashes with analog command interface, suitable for use with all bodies, especially those capable of TTL flash operation. 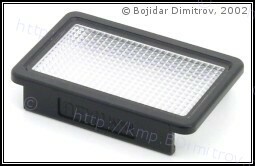 Non-TTL — flashes with analog command interface, suitable for use with all bodies. The AFT1, AFT2, and FT converge flash coverage to 29° (85 mm lens). Flash range is increased by about 40%. The AFW1, AFW2, and FWA spread flash coverage from 75° (28 mm lens) to 84° (24 mm lens). Flash range is reduced by about 50%. The FWB spreads flash coverage from 63° (35 mm lens) to 75° (28 mm lens). Flash range is reduced by about 50%. Hot Shoe Adapter F features a male hot-shoe on its bottom, a hot-shoe socket on top and a 5P socket on its right side. This adapter interferes with the built-in pop-up flashes of the MZ/ZX bodies (for contrast-control flash operation). Hot Shoe Adapter Fg features a male hot-shoe on its bottom and a 5P socket on top. 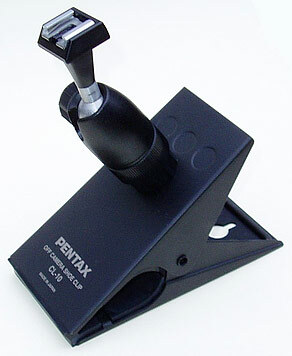 It is suitable for all Pentax bodies. 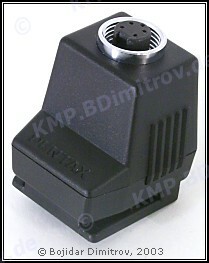 Hot Shoe Adapter MV/MV-1 features a male hot-shoe on its bottom, female hot-shoe on top, and a PC socket in its front. 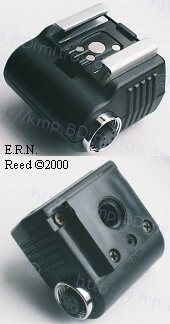 It transfers only the "trigger" and "ready" flash signals. Off-Camera Adapter F features a tripod socket on its bottom, a 5P socket on the side, and a hot-shoe socket on top. 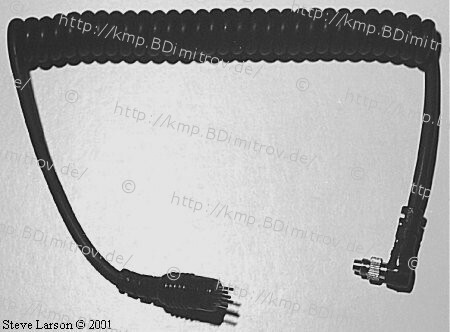 The 4P cords and connectors have 4 pins and 4 wires. They are TTL-capable and transmit the "ground," "trigger," "ready," and "mode" flash operation signals for analog-control flashes. 4P Multi Cord — 4P plug to 4P plug. 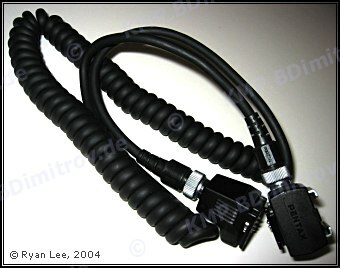 4P Sync Cord A — coiled; 1 meter long; LX PC-TTL plug to a 4P plug. 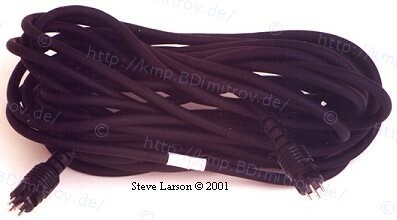 4P Sync Cord A (5m) — straight; LX PC-TTL plug to a 4P plug. 4P Sync Cord B — coiled; 1 meter long; hot-shoe plug to a 4P plug. 4P Sync Cord B (5m) — straight; hot-shoe plug to a 4P plug. 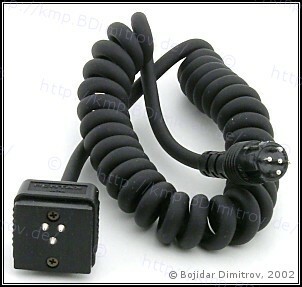 4P Sync Cord C — coiled; 1 meter long; PC plug to a 4P plug; not capable of TTL. The 5P cords have 5 pins and 5 wires. These are TTL-capable and transmit the "ground," "trigger," "ready," "mode" and "digital" signals for digital-control flashes. 4P and 5P cords and adapters are incompatible with each-other. Sync Cord F 5P — coiled; 0.90 meter max extension; 5P plug to 5P plug. 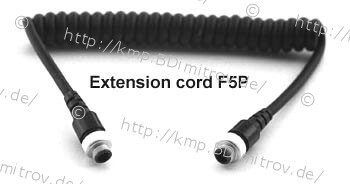 Sync Cord F 5P 6 ft — partially straight, partially coiled; 1.8 meters long; 5P plug to 5P plug. 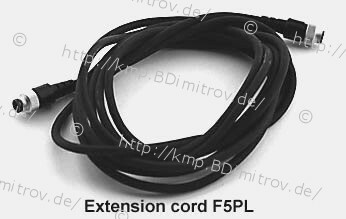 Sync Cord F 5P (L) — straight; 3 meters long; 5P plug to 5P plug. Distributor — features one 4P socket for input and three 4P sockets for output. 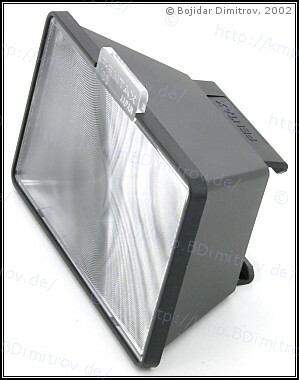 It is suitable for connecting up to three external flashes (via 4P cords). Hot-Shoe Grip — features a variety of sockets, including a hot-shoe on top and a 4P socket on the side. Off Camera Shoe Clip CL-10 — features a metal clip for attaching to a fixed object and a hot-shoe for attaching a flash. The hot-shoe is not operational, so you will need a wireless flash in order to use this device. Dimensions 70 x 143 x 130 millimeter, weight 460 gram.